We are back from our island paradise in Ocho Rios, Jamaica....boo hoo! I love it there so much! Wee Bear says it's the only time in the year, I truly relax. He is right, I sit and sip coconut water in a lounge chair and stare lazily out to the sea. I enjoy watching the fishermen go by, the "Big Birds", who land in our tree and dive into the ocean right in front of me to catch a fish . I love taking my raft and heading down our stairway to the ocean and floating along with the waves. I love getting massage on our veranda, going to the local salon for a pedicure and manicure and talking to the locals about life in Jamaica. 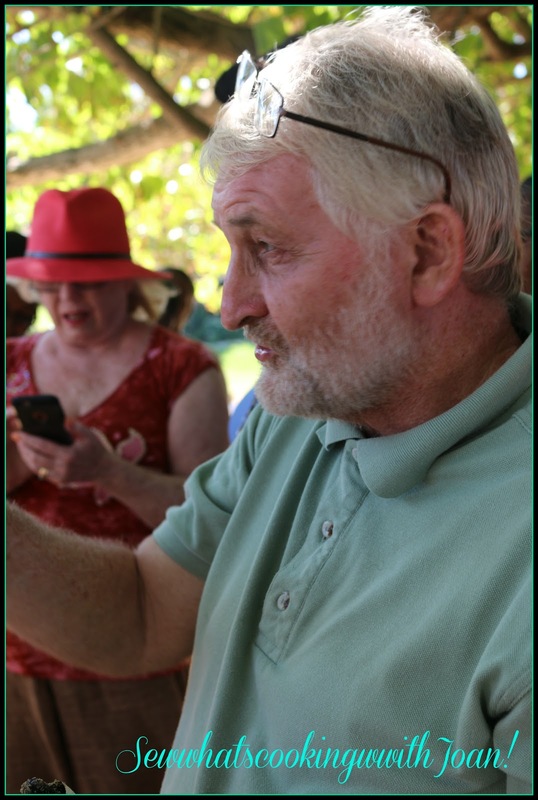 One of my very favorite things to do while in Ochi (local talk), is "Releasing the Sea Turtles". We were lucky enough this year to participate in the release. They are usually being hatched in August and September, but, this year there was a late group of 94! I wrote more about this below today's recipe. This is a market tour, for more pictures of this fun tour and cooking class go to Chef Maurice goes to the local market! 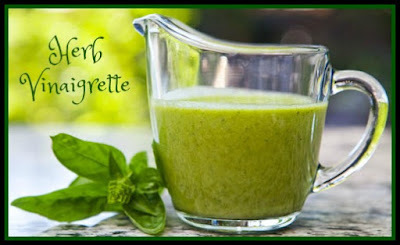 Today's recipe is my favorite salad dressing ever! 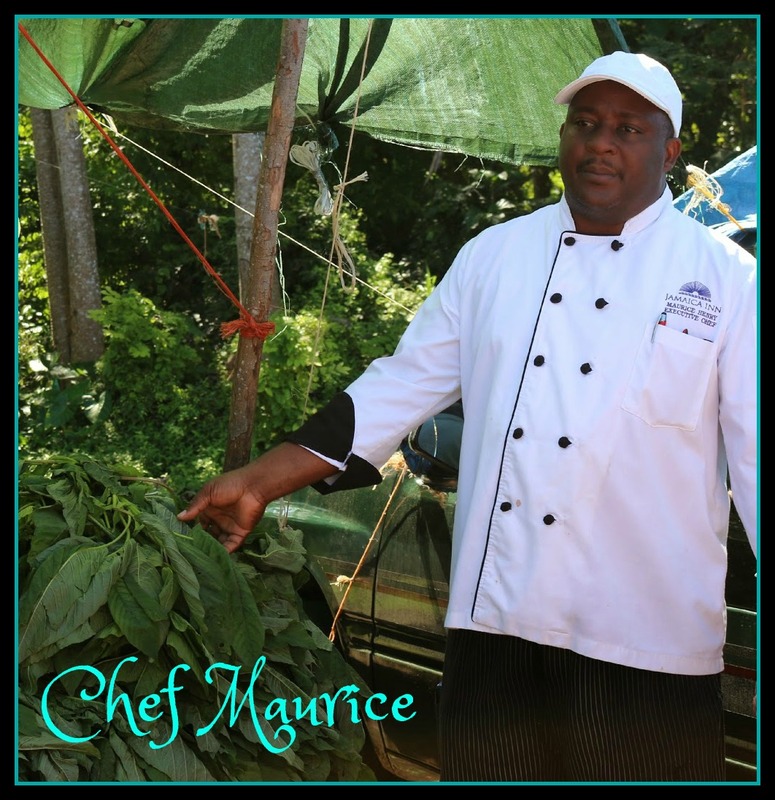 It comes straight from Chef Maurice at Jamaica Inn. I have the "Market Salad" with this delicious dressing everyday that we are in our cottage at Jamaica Inn,(three weeks) sometimes twice!! 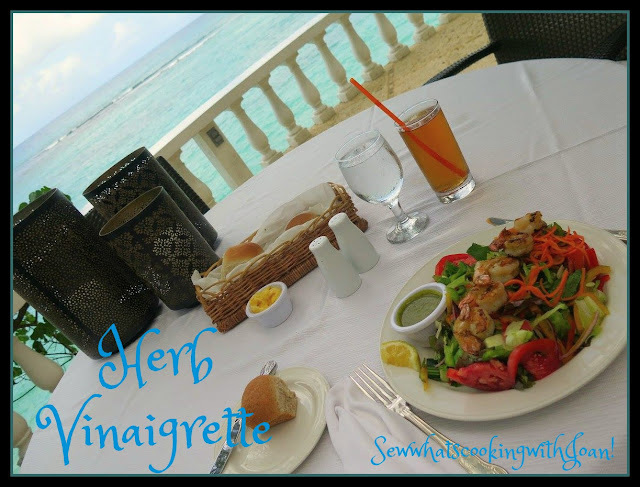 My lunch is usually the market salad, extra cucumber with herb vinaigrette and grilled shrimp.....everyday! In the evening, it's market salad, extra cucumber and herb vinaigrette, catch of the day blackened and steamed fresh vegetables. 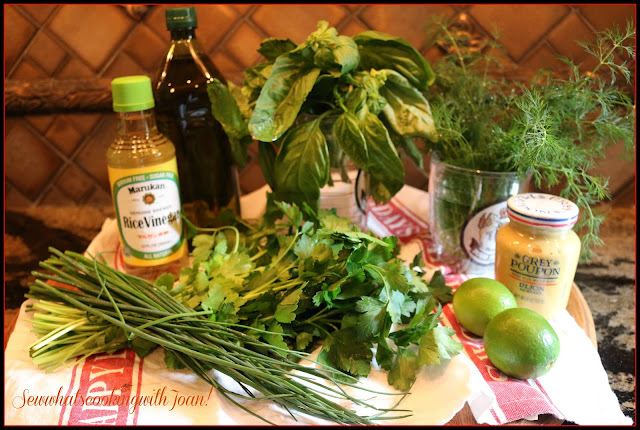 I can't get enough of this farm to table salad and herbal dressing. I asked Chef Maurice is he would share the recipe, and he was kind enough to bring a hand written recipe to my dining table the night before we left paradise. I am so excited to have this recipe!! I know you will love it too! In a small bowl, whisk together the wine vinegar, Worcestershire sauce, mustard, garlic, sugar, salt and pepper. Add the mixture to your food processor or blender with the herbs and blend. Turn to low and slowly drizzle in the olive oil to form a thick dressing. Chef Maurice shared another one of his delicious recipes with me a few years ago, you can find it at Cheese and Potato Soup. My favorite thing to do in our paradise! Release of 94 sea turtles! Mel Tennant came to Jamaica in 2003, purchasing a home overlooking Oracabessa’s Gibraltar Beach, and expecting to enjoy his retirement in tropical quiet. The following year, Tennant observed turtle tracks on Gibraltar Beach for the first time. Further investigation led him to find that most of the adult turtles were either killed and their nests dug up. The destruction of a critically endangered species would soon put an end to his tropical retirement, and send Tennant into a newfound mission to protect the sea turtle. We got a call from reception at Jamaica Inn at 9:15 AM, there is going to be a release! We dropped everything we were doing and walked over to the beach. We watched the little sea turtles come up out of the sand with help of staff and Mel. Mel explained in detail the story of the sea turtle and how he is helping. It is fascinating. We then picked up a sea turtle, washed it in the sea water and placed into a bucket. The bucket was filled with 94 that were ready to go to sea and a few that needed to be incubated. The bucket was tipped over and the sea turtles head toward the sea. This is when they develop their GPS, so they must do the walk to the sea on their own. The females will come back to this vary beach to lay their eggs, in about 5 years, the males will never come back. I have so many beautiful photo's, but, I just needed to put this little guy in. 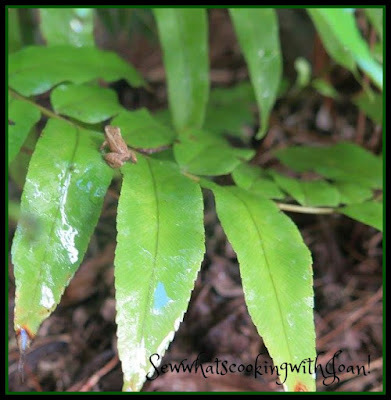 He was on the foliage near our out door shower, while I was showering. He is just adorable! 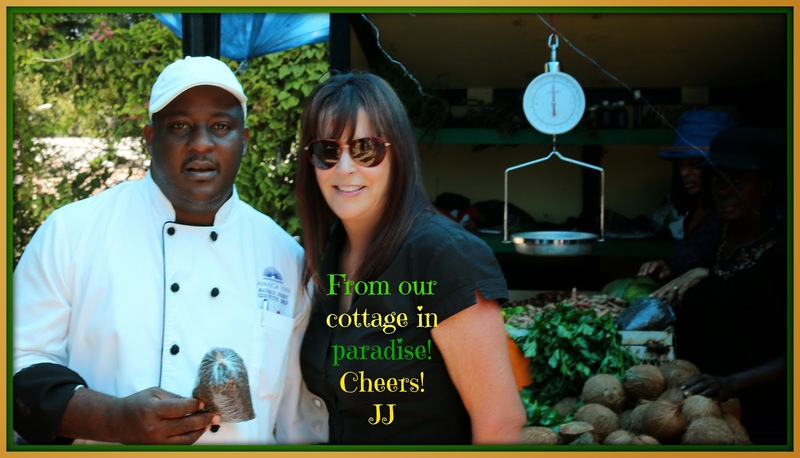 Chef Maurice is an amazing chef at Jamaica Inn!